Communicating with a host computer can allow a simple Arduino-based system to gain access to a wide variety of devices and information. 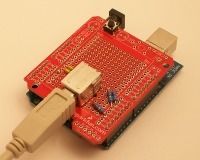 Most people link an Arduino to a host using serial communications across a USB connection with custom code running on the host to send information to the Arduino or receive it in return, but giving your Arduino the ability to pretend to be a keyboard or mouse opens up a whole world of possibilities because it means your Arduino can interact with software that was never intended for external control. That could be desktop software such as a game or a web browser: your Arduino could “type” into a web form and submit it on your behalf, or act as a custom controller for a game! Or you could use an Arduino to connect a custom input device to your computer so that it emulates a regular keyboard or joystick. The custom input device could be a chording keyboard, a virtual keyboard, or even something like a virtual reality glove or head tracking system controlling your pointer by emulating a joystick.